Recently, Sir Cussalot and I were driving to a nursery to buy some trees for our new digs when I had a MAJOR epiphany. We wanted to put a clump of three palms on each side of the gated entry, but we couldn’t decide which type of palm to use. 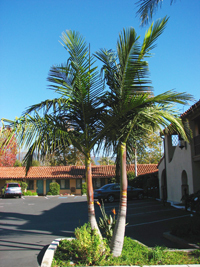 We were told that the king palm looks the best when grown like that, but it was not very cold tolerant. 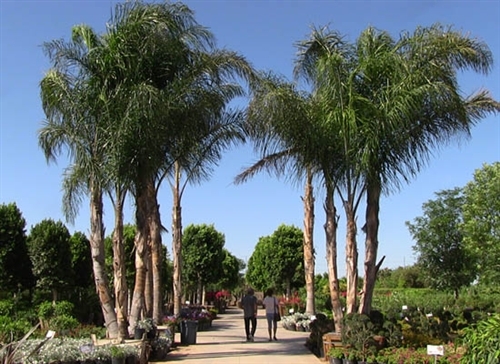 We read and people also told us that the queen palm was more cold tolerant, but we thought we liked the looks of the king better. The problem was that, as is not the case when identifying same in humans, we were not sure how to tell which were the kings and which were the queens. We read descriptions of each and even looked at photos of both, yet we were still not sure how to positively tell the difference. I likened it to describing the colors red and blue to a blind person. If, all of a sudden they were no longer blind, would they be able to identify the different colors from the written or verbal descriptions they had received before they could see? I doubt it because they would have no frame of reference really. Everything we had read online described the king as having a tall green leader and green at the top of the trunk. Well, I saw plenty of palms like that sorta looked like that. I tried and tried to figure out which was which, but to no avail. Then, as we were driving through a residential neighborhood, I saw it! There they were, side by side, and it became as plain as the nose on my face! I finally SAW the green at the top of the trunk and the color of the fronds. The difference, once unseen by me, became completely clear. They were as different as red and blue, but it wasn’t until I saw them next to each other that I was able to see that! So who cares? You may be asking yourself. Ah, I will explain my epiphany. For years I have worked with people to help them to see structure in horses and dogs and how it relates to real performance (not just trotting around the show ring). Some never “get” it and that frustrated me because I was unable to help them see. When, however, I see the look on somebody’s face when they DO “get” it, well, that makes all of the crap I take for my structural beliefs from those who don’t believe it, well worth it! Many can read the words or be told over and over and over again and even look at photos, but until they put their hands on the animal and stand there comparing more than one dog or horse or pony, they just do not see it. Some even go so far to exclaim that what they are reading or being told is just not so. If they don’t see it, they don’t believe it. If, however, somebody is determined to see it and they believe what I am telling them, they will continue in their quest to learn and eventually they will see it. The same is true for most things in life. Dog training and handling is another example. I see people at trials who try to do a lead out pivot but have not had good instruction on how a LOP should be trained and executed. Some even try to say that the LOP is lying to your dog. That is because they do not truly understand it. If they did, they would understand that the dog knows exactly where they are going and what is going to happen because they have been trained to do so. I see people at trials all the time who stand in the wrong place or face the wrong way and their dog is genuinely confused. So others look at that and claim the LOP doesn’t work. That is just one handling example but there are many more. When we train our dogs, we always try to show them what it looks like if we want them to do one thing and what it looks like if we want them to do something different. Let’s use an aframe/tunnel discrimination as an example. This weekend I messed up Pankies in standard because I headed her to just such a thing and expected her to read my mind as to which one to take. I knew I needed a threadle arm and to tell her verbally which one to take in plenty of time. I did neither and got the tunnel instead of the aframe. I know from practice that if I don’t let her know with a threadle arm and a timely verbal that she will pick the wrong obstacle much of the time (and that wrong obstacle is not always the same one. Sometimes she may choose the AF and sometimes the tunnel but she will make the executive decision if I drop the ball). To train it, I show her what is looks like and sounds like when I want the AF and then do the same with the tunnel. It is a skill that must be maintained or it goes away quickly. If I just trained the AF with a tunnel underneath and never did the tunnel in the same session, she might not get that there is a distinct difference. Then, of course, I need to not be a moron at a trial like I was today and drop the ball! You can apply the same thing to raising kids or training people for jobs or in school. Sometimes we need to show them the difference in person in order for that light bulb to glow! « There Must be a Pony in here Somewhere! …& the moral of this digression is: Perhaps someone should apply it to the breed ring folks, and they’ll finally get it! Scoop up the poop, breed ring people! Scoop up the poop!